Every year, our beautiful women's gift hampers increase in both beauty, and popularity and we're so proud of their sell-out success that we're doing our very best to make sure that our favourites are always in stock so that the women in your life have the chance to experience our luxurious gift hampers year-round. Without a doubt, when it comes to finding the perfect Valentine's Day gift hamper for women, or the Australia's best Mother's Day gift hampers, we always recommend ordering early, so we can guarantee that the special woman in your life won't miss out. 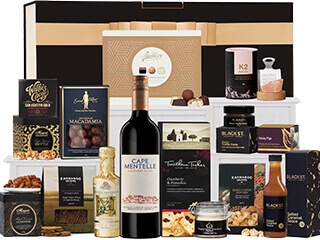 This year, our hamper designer has done it again, with a range of luxurious 2019 women's gift hampers that are packed full of world-class luxuries at a price to suit every buyer's budget. We've worked hard to team up with some of the world's most impressive brands so that when one of our women's gift hampers arrives at her door, she feels amazing and she thinks you're wonderful too, for choosing such a luxurious gift for her. Whether she is a food enthusiast or a lady who loves to celebrate with a glass of bubbles, The Hamper Emporium has it all. The Hamper Emporium has a great selection of gift hampers that are perfectly designed to suit women of all ages. If you are looking for something she will love for Christmas too, be sure to check out our Christmas range! 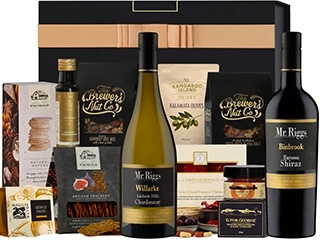 The Hamper Emporium is one of Australia’s leading suppliers of gift hampers for her, so we certainly have a good idea of the products that are suitable for gift hampers for her. If you find yourself in need of some inspiration, simply browse our range of luxury women's gift hampers and you're sure to find something special that will suit her. Created by the gift hamper experts at The Hamper Emporium, are you ready to discover the secrets of gift hampers for her? What Gifts Will She Find In A Hamper for Her? There are many different things that can be included in our women's gift hampers. 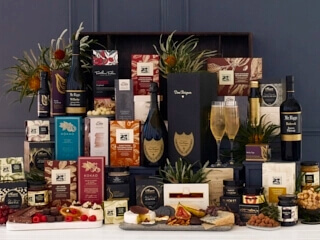 We've spent decades creating great relationships with some of the world's finest brands, and sourcing exclusive product pairings so that we could create Australia's best gift hampers. Most products you should include will align with the personal preferences of your recipient, but if you are not that familiar with your recipient’s preferences, then there are always some basics to fall back on. For the gift hampers at The Hamper Emporium, our team selects products that are loved by all Australian women. Good examples of such products are chocolates, sparkling wines, luxury skincare products, and delicious gourmet nibbles. For each of our gift hampers for her, we try to incorporate a large variety of products. The variety of products is necessary because it ensures that there will be several items that your recipient likes, and if there are things that aren't to her tastes, then she'll love sharing them with those close to her. What Is Included In Luxury Mother’s Day Hampers? While most gift hampers for her can be used as Mother’s Day hampers, there is a difference between the average gift hamper for her and Mother’s Day hampers. At The Hamper Emporium, our team focusses on pampering products for mums, since a pampering experience is something every mum deserves on her special day. There are several products that could classify as pampering products. Common options include a plush robe, chocolates, and skincare products. There are also additional options such as a good bottle of champagne or sweet biscuits. Since there are many products inside Mother’s Day hampers, it is always a good idea to browse our collection of Mother’s Day hampers to get some inspiration. Who knows? You might find that one of our Mother’s Day hampers is perfect for your mum. Our beautiful packaging and presentation ensures that all of our women's gift hampers are suitable to have delivered no matter the occasion. What Gourmet Gifts Will Be Inside Women's Gift Hampers? 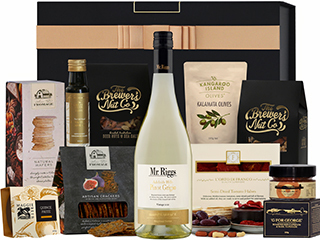 To ensure we can hold our status of having Australia's best gourmet food hampers for her, The Hamper Emporium looks at the most popular products among women in Australia. For Australian women, sweet food products tend to do best; this includes chocolates, sweet biscuits, and chocolate-covered treats. So, when selecting foods for gift hampers for her, food products with a certain sweetness usually go down well. 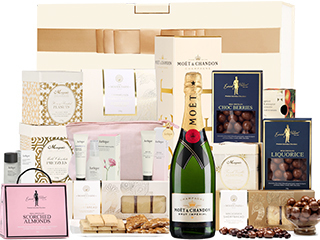 What Is Included In Women's Moet Gift Hampers? We can mention all the products you could use for a gift hamper for her, but it is even better to show you. Below, you can find some of the most popular gift hampers for her in our collection, so we are sure you can get some inspiration here. 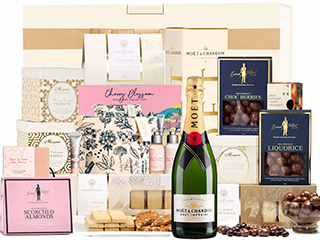 Our Personalised Moët Rosé & L'Occitane Hamper is one of our most versatile hampers for her. If you are looking for a hamper that's filled with luxury and elegance, then this beautiful gift hamper for women is the perfect choice. One of the exquisite products that can be found in the Moët Rosé & L'Occitane Hamper is a genuine bottle of Moët Rosé. This exquisite brand is often served at Australia’s high-end restaurants, but also VIP events around the world. It is well-loved wine that's guaranteed to be adored when she recieves this limited edition gift hamper to her door. If your recipient is a true foodie, then the Ultimate Foodies Hamper will be the best choice. 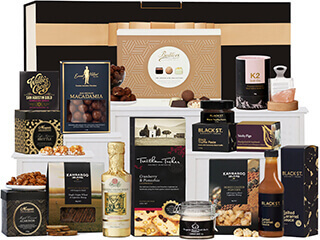 Our Ultimate Foodies Hamper provides the ultimate collection of gourmet treats, including some award-winning pantry items from Black St. Gourmet. Our gourmet food hampers come in a range of varieties and include not only some of the world's best gourmet fare, but also some of the world's most impressive wine and champagne. For a truly special gift idea, she'll love going on a beautiful journey of flavour. 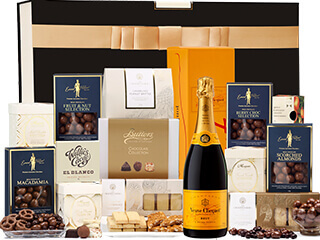 If your lady loves to celebrate with a glass of champagne, then this hamper is perfect for her. 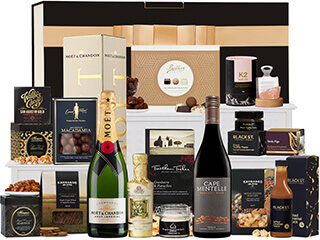 The Chandon With Australian Chocolates & Nuts Hamper includes golden sparkling Australian wine from Chandon simply paired with a beautiful selection of chocolates and nuts all beautifully made in Australia from our favourite artisan producers. For the special woman in your life who deserves the ultimate in pampering treats, our exquisite L'Occitane Pamper Hamper is guaranteed to impress. With an impressive selection of L'Occitane skincare, this stunning French skincare brand creates spa-quality skincare that is renowned the world over for it's nourishing properties and use of natural ingredients. We've paired this luxury skincare with exquisite nibbles and treats that will make her feel like the most loved woman in the world. 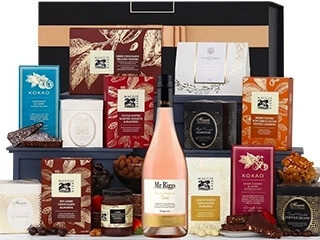 What to Put in Australian Women's Christmas Hampers? Australian Christmas hampers usually contain a collection of Aussie products with a Christmas theme. While you might think that this limits your options for Australian Christmas hampers, it is quite the opposite! Common products you can include in Australian Christmas hampers include Aussie butter shortbread, nut mixes, cranberry relishes, and other delicious items that fit the holiday season perfectly. Need some inspiration for your Australian Christmas hampers? Check out the Australian Christmas hampers at The Hamper Emporium for some amazing options! We offer a range of luxury women's Christmas gift hampers that are filled with special products to delight her. Of course you don't need to just choose from our Christmas gifts range during the festive season, if you're looking for a beautiful women's gift hamper this Xmas then browse our entire range of gift hampers for her and no matter the occasion, she's sure to love it. Here at The Hamper emporium we're proud to claim the title of having Australia's most beautiful women's gift hamper range. 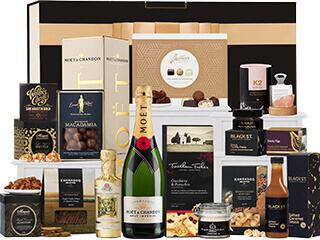 Our unique and luxurious hampers for your loved one arrive beautifully presented in our custom gift boxes, filled with the world's finest treats and gifts. We truly believe that the best way to show you care about someone is by sending a gift hamper. Don’t miss an opportunity, browse through our wide selection of hampers designed meticulously keeping her likes and dislikes in mind. A quality selection of chocolates, nibbles, sweets and wine is sure to be enjoyed by all. The hampers are perfectly designed to suit any occasion from birthday to Mother’s Day. Give that special lady in your life the love she deserves with a hamper from The Hamper Emporium and rekindle the love. The Hamper Emporium regularly creates gift hampers intended for specific recipients. Therefore, it is not surprising that our extensive range contains many gift baskets that were created with female recipients in mind. Inside these hampers, customers can find a variety of products; this includes champagne, cosmetics, wine, chocolates and a whole lot more. So, no matter the personal preferences of your female recipient, customers can always find a hamper that matches their recipient’s desires. To ensure the entire hamper is suitable for your female recipient, our hamper designer makes sure that each keepsake box holding the products has a beautiful design that will appeal to women. Which Hampers for Her Are Suitable aAs A Women's Birthday Hamper? Customers could choose any of our hampers for her and use it as a birthday hamper. Our collection of hampers for female recipients contains hampers that are suitable for a variety of special occasions, so if you need a birthday hamper, you can certainly find it in our hampers for her range. When choosing a birthday hamper for your recipient, be sure to incorporate some of your recipient’s personal preferences. Common loved items inside a birthday hamper include chocolate, champagne, and sweet nibbles, but other items could be a match for your recipient too. Can I Use These Hampers for Her as Mother’s Day Hampers? The Hamper Emporium has a special section containing Mother’s Day hampers, but this does not mean you cannot use any of the hampers found in our hampers for her section. Since each of these hampers is made for female recipients, you can easily select some Mother’s Day hampers from this range too. Before the checkout, we always urge customers to check out our collection of Mother’s Day hampers too. There are quite a few unique things to find in this collection, so we are sure you will appreciate the range where uniqueness and quality is concerned.